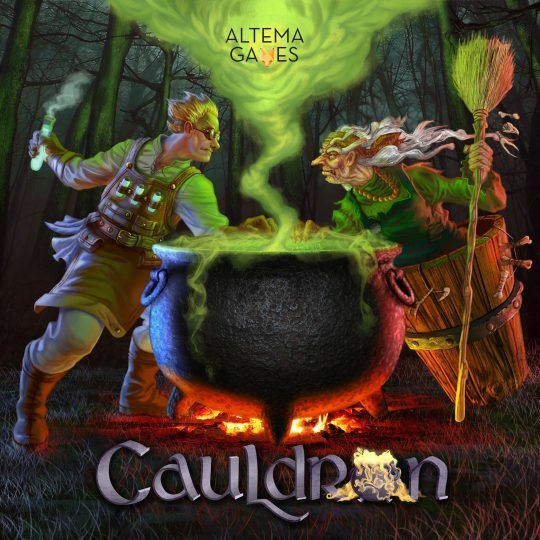 Cauldron is a competitive board game set in a fantasy world. Taking on roles of powerful mystical characters like the Druid, the Shaman or the Wizard, players will brew potions to grow their magical power, while casting spells to stop others from getting ahead. Cauldron is a resource management game that plays with 2-5 players aged 10+ in 1 hour. Play revolves around a central set of fields, producing potion ingredients each season (frog legs, spider webs, dragon eggs etc). Each player has potions – way to combine ingredients to score Magik (game’s victory points and currency). Players take turns harvesting ingredients, brewing potions and attempting to steal ingredients from competitors. Each player also has a hand of spells – one-time effects that help the player or hinder opponents. Each character has variable powers that modifies the way basic actions are resolved. After all ingredients have been harvested, players have a chance to invest some of their Magik to buy additional potions, spells or add fields to the game board. Balancing investment with advancement is a crucial part of the game. The game proceeds until one of the player reaches 35 Magik – that player is the winner. The game has an element of luck and conflict present but the majority of it revolves around resource management, planning and balancing short and long term investment.